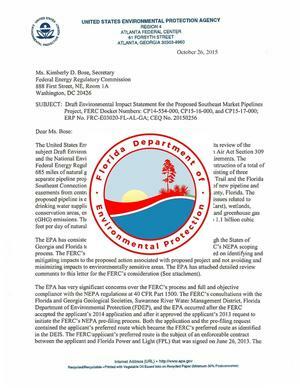 On Oct. 26, the U.S. Environmental Protection Agency wrote to the Federal Energy Regulatory Commission, saying it had “very significant concerns” about the process of choosing a route because of the threat of pollution to the Floridan Aquifer and the impact on conservation areas. But the Florida Department of Environmental Protection joined Sabal Trail Transmission, LLC in objecting, and Canter refused the request. A spokeswoman for the DEP, which is overseen by Scott’s office, was twice asked whether the permit should be re-evaluated in light of the EPA comments. Each time, she answered with a statement that neither acknowledged nor addressed the EPA concerns. John Quarterman, president of the WWALS Watershed Coalition, told POLITICO Florida that the permit never should not be issued because of concerns about the project. WWALS refers to the Withlacoochee, Willacoochee, Alapaha, Little, and Upper Suwannee River watersheds in south Georgia and north Florida. A Sabal Transmission LLC spokeswoman said the company now is coordinating concerns with state and federal agencies and is not considering changing the proposed project or route. So the usual: Spectra isn’t listening. As for on target, we shall see. Even if FERC issues a permit, the pipeline still can’t be built without the DEP permit, or the GA-EPD air quality permit for the Albany, GA compressor station, or the U.S. Army Corps of Engineers permit, among others. The article concludes with Sabal Trail’s assertions that nobody can question its alleged need for the pipeline. Do you think profit for Spectra and FPL and Duke is excuse for them taking your land, drilling under your rivers, or risking your drinking water or taxes to fix their leaks or explosions?